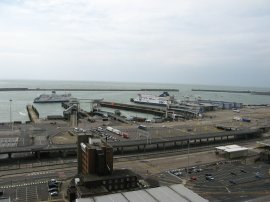 I did this walk on Sunday 17th May, driving down to Sandwich then taking the train to Dover. The single ticket cost £5 which was 90p more expensive than last time. 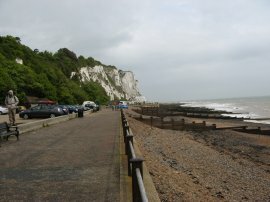 From Dover Station it was just a short walk back to Biggin Street, photo 1, where I resumed my walk along the White Cliffs Country Trail. 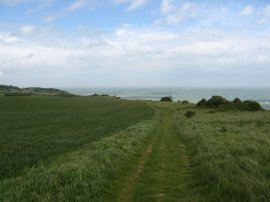 This stage of the walk follows the same route as the Saxon Shore Way between Dover and Sandwich, a stretch of path which I had last walked in the opposite direction back in August 2006. From Biggin Street the route heads into King Street, takes an underpass under the A20 and continues on to join Marine Parade. 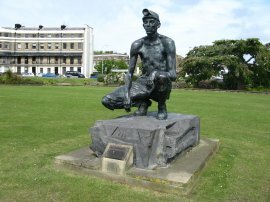 Here I turned to the left, walking alongside the harbour towards Dover Eastern Docks and passing the statue of the Waiting Miner, photo 2. This statue sculpted by H Phillips was commissioned by the C.E.G.B. and sited at Richborough Power Station in 1966. 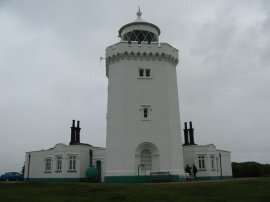 It was relocated to the Marine Parade, Dover following the closure of Richborough Power Station in September 1997. A swimming race was taking place in the harbour and as I went by a competitor was gingerly entering the water from the beach. 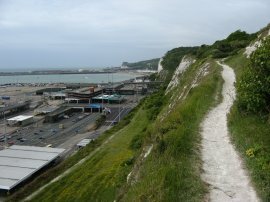 Leaving Marine Parade the route heads slightly inland along East Cliff and I then continued along Athol Terrace to join a footpath that heads under the A20 and up on to the chalk downs above Dover, gradually rising above the Eastern Docks, photo 4. 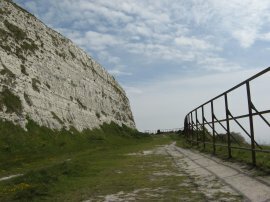 However I think I was slightly off course at this point, the route of the White Cliffs Country Trail seeming to take a lower path up from Dover which must start very near to the entrance to the docks. I headed down the path on the right of photo 5 however the map seems to show the route as coming up the track on the left hand edge of the cliffs along a small section of path where the route differs from the Saxon Shore Way. Having re-joined he correct route I then continued ahead running alongside the Langdon Cliffs, photo 6. 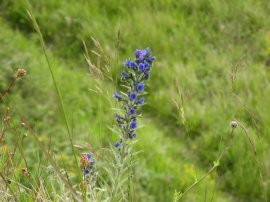 The area was a haven for wild flowers growing on the chalky soil, including the plant in photo 7 which I think might be Viper's Bugloss. 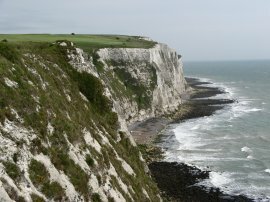 As I ascended I got a good view of the white cliffs of Dover, looking out of Langdon Bay, photo 8. 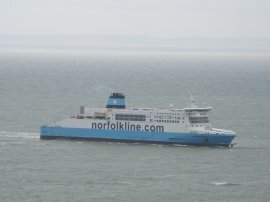 There was a steady stream of ferries arriving and departing from Dover and althougth the weather turned a bit gloomy for a while the coast line of France was clearly visible on the horizon, photo 9. Just like last time I walked here my mobile phone picked up a French transmitter and I got a "Welcome to France" text message. "Calls to the UK cost only 35p per min", so 5p cheaper than three years ago. At the top of the cliffs the route heads round Langdon Hole, photo 10 and continues over the cliffs tops, passing Fan Point and heading towards the South Foreland Lighthouse, photo 11. It was a very windy day, the wind strong enough to make walking in a straight line difficult at some points, although fortunately the wind direction was more or less behind my back, and also blowing slightly on shore. I would not have been that happy on the cliffs if the wind had been blowing off shore! At the lighthouse the route heads inland slightly to join a track for a while before taking a footpath on the right that heads back to the cliff edge as the route starts making its way to St Margarets Bay. My walking group friends were walking on the Saxon Shore Way from Kingsdown and I met up with them on this stretch of path, just as it started to rain. We stopped for a quick chat and also debated whether it was going to be necessary to put on waterproofs. I decided not to and this turned out to be a good choice as the rain did not last too long and, as can be seen from the latter photo's, it turned into a nice sunny day, although the strong wind was ever present and if anything felt even stronger on the flat ground near Pegwell Bay. Approaching St Margarets at Cliffe the route once again heads briefly inland to join a track that heads down past the Pines Garden towards the bay, photo 12. Leaving the bay the route heads up a flight of steps, photo 13, which takes the path back up to the cliff tops, close to the memorial, photo 14, to the Dover Patrol. This consists of an obelisk of granite 83ft. 9ins high and was unveiled by H.R.H the Duke of Windsor (then Prince of Wales) on 27th July 1921. 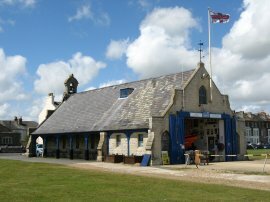 There is a tea hut besides the memorial and I was quite tempted to stop to get out of the wind however it was still relatively early for a break and I had a full pack lunch, so I continued on. 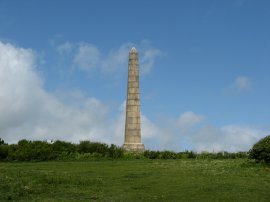 From the memorial the route heads along the cliff top, besides the National trust property of Bockhill Farm towards Hope Point, photo 15. 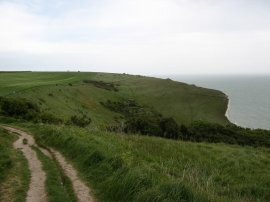 The route then heads past some cliff top houses before starting to descend towards Oldstairs Bay, photo 16, which marks the end of the White Cliffs. 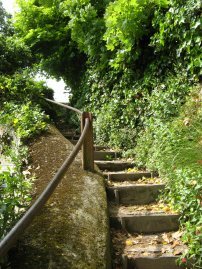 The path passes the club house of the Walmer and Kingsdown Golf Course before taking a flight of steps that lead down to the road at Oldstairs Bay. Halfway down the steps was a bench which was nicely sheltered from the wind where I stopped and had the first of my sandwiches. 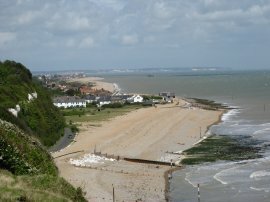 After an enjoyable rest out of the wind I headed down to the road which is followed to the outskirts of Kingsdown where the route takes a footpath on the right that runs down to join a track, Wellington Parade, that runs between houses and the beach. There is a real variety of architecture on display from small cottages to grand houses, some attractive, some strange and frankly awful. 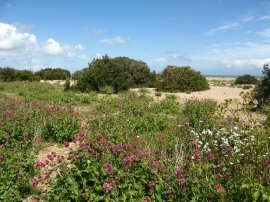 At the end of the parade the route joins a tarmac footpath and cycleway that runs along the top of the beach past the flowers and low trees growing on the shingle, photo 17, at the start of a long and straight walk to Deal. 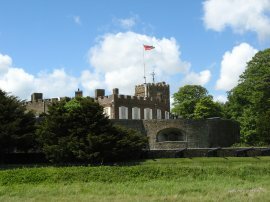 A short distance down the path the route passes Walmer Castle, photo 18, the official residence of the Lord Warden of the Cinque ports. 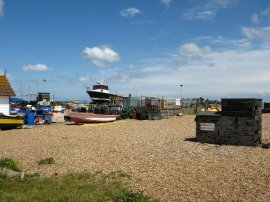 Continuing on past Walmer the footpath, photo 19, eventually reaches the town of Deal which is one of my favourite places on the Kent coast. 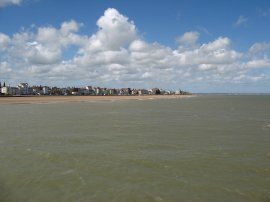 The expanse of shingle between the shore line and sea narrows as the route heads through the town, passing the Deal Lifeboat Station, photo 20, and also some of the fishing boats that, like in Hastings, are moored on the shingle beach, photo 21. 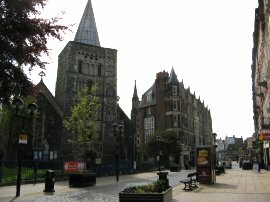 Approaching the centre of town the route passes Deal Castle, photo 22, built by Henry VIII between 1539 and 1540 as an artillery fortress to counter the threat of invasion from Catholic France and Spain. It is shaped like a Tudor rose, being perfectly symmetrical, with a low, circular keep at its centre. Around the circumference of the keep are six bastions, with a further series of six bastions in the curtain wall, one of which serves as the gatehouse. All the outer walls of the castle and bastions are rounded to both provide strength and to deflect shot more efficiently than flat walls. 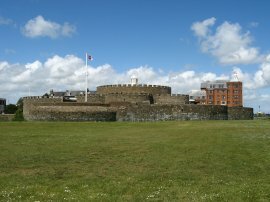 Over 200 cannon and gun ports were set within the walls and the entire structure was completely surrounded by a very deep, wide moat. 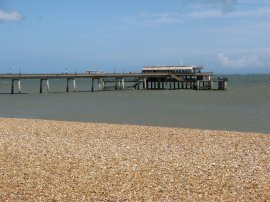 On my right the 1026ft long Deal Pier stretched out into the sea and a little further on I passed the Deal Timeball Museum. 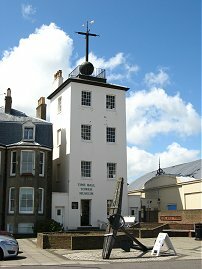 The Deal Timeball is a Victorian maritime Greenwich Mean Time signal located on the roof of a waterfront four-storey tower, photo 24. The timeball, which, like the Greenwich timeball, fell at 1 pm precisely, was triggered by an electric signal directly from the Royal Observatory and enabled ships at sea to accurately set the time. 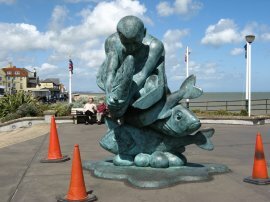 Detouring slightly from the path, I went and ate my lunch at the end of Deal pier, passing the unusual "Embracing the Sea" sculpture by Jon Buck, photo 25, at the entrance to the pier. 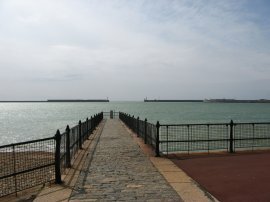 A new restaurant has been built at the end of the pier which gave a little shelter from the wind while I sat and ate the rest of my sandwiches, looking back towards the town, photo 26. Lunch over I headed back down the pier and continued my way to Sandwich, the path now heading alongside Beach Street and then The Marina to reach the edge of the town, from where photo 27 was taken, looking up the coast towards Pegwell Bay. 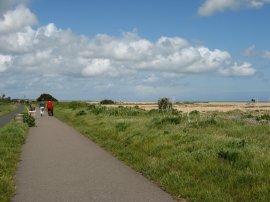 Leaving a the seafront path the route now takes a footpath that runs alongside the fairways of the Royal Cinque Ports, just below the sea wall embankment which cuts off any view of the sea. Eventually the path heads up onto the embankment, photo 28, and continues straight ahead for some distance to pass the houses of the Sandwich Bay Estate where the rather bumpy surface of the embankment becomes a tarmac road known as Princes Drive. Just past the estate a Ray fishing competition was due to take place, starting an hour or so after I went by and most of the competitors were lined up at one of the 50 allocated pitches along the beach, sheltering from the wind under a line of multi coloured umbrellas, photo 29. 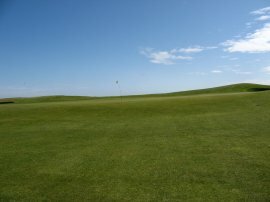 A short distance further up Princes Drive the route finally leaves the coast, taking a footpath on the left that heads across the fairways of the Royal St Georges Golf course, photo 30. 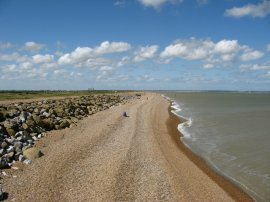 Before leaving the sea I stopped for a little rest on the beach, the steep banks of shingle once again providing a little shelter from the wind. 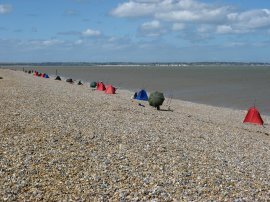 The sun was by now quite warm and I could have easily dozed off listening to the sea, curled up on the beach with my rucksack as a pillow! 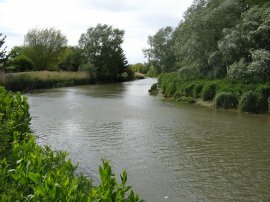 Leaving the golf course the route crosses a minor road and the heads over North Stream to join a footpath that runs between trees down to Sandwich Haven, photo 31, on the outskirts of Sandwich. Here the White Cliffs Country Trail crosses over another small stream, Vigo Sprong before turning to the left to join a path that runs along the old town walls. 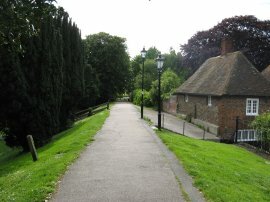 Crossing the small Sandown Road, the route heads along Mill Wall, photo 32, which is followed to new Street where I ended this stage of my walk along the White Cliffs Country Trail. 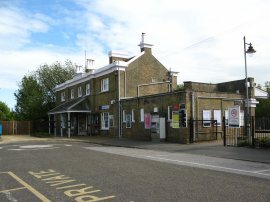 From there it was a very short walk back to the car at Sandwich Station, photo 33. Reaching the car I had walked a total of 17.2 miles. For the second week running I had developed a blister on my foot but this one was nowhere near as painful as the one last week, this one being on the sole of my right foot just behind the toes. Luckily I had no more problems from the previous blister on my left heel despite the amount of this walk done on tarmac paths. The weather had turned out far better than expected, the clouds disappearing in a matter of minutes as I left St Maragarets Bay, and the strong wind was never blowing in my face. 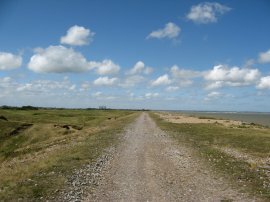 I now just have a fairly short circular walk to do from Sandwich to complete the route of the White Cliffs Country Trail as marked on the OS Explorer maps.